Aspen’s rail industry trailers (Special Purpose Series) are specific rail equipment hauling trailers and are designed primarily for on road, regular duty rail industry applications. This trailer has payloads of 35 tons to 45 tons, with an axle configuration of 6 and 7 axles (including truck axles). Aspen rail industry trailers feature hydraulically removable or folding goosenecks, four rail decks with integrated standard gauge steel rails, square tail rear frames and have tri-axle common air suspensions. Aspen’s rail industry trailers are used primarily for applications in the rail equipment moving industry and are designed specifically for rail maintenance equipment. Standard specifications include a hydraulically driven 20,000 lb worm gear winch with cable and removable rail ramps for use with non-rail loads for increased loading capabilities. Experienced Design … Aspen’s rail industry trailers are meticulously designed by Aspen engineers with over 240 years of combined trailer engineering knowledge. Not only is engineering knowledge important, but the combination of specific trailer industry experience and mechanical engineering knowledge makes our product one of the best trailer brands in the industry. 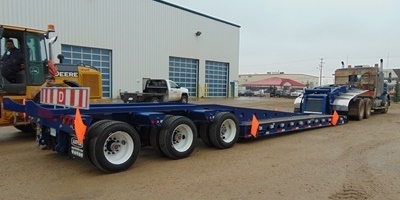 Aspen’s rail industry trailers are designed from the load down to maximize payload capacity and minimize tare weight. 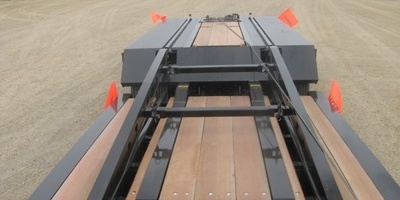 The rail industry trailers take advantage of Aspen’s “flex frame” design which allows the frame to flex in all of the right places to allow frame deflection without breaking in key areas of the trailer. 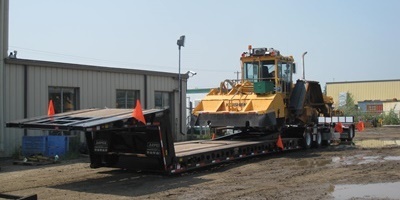 Aspen’s rail industry trailers have been specifically designed to deal with rail industry equipment so that you can Haul More rail bed maintenance equipment or mixed loads and deliver them to the next work site. This ensures that your payload of maintenance equipment is hauled safely and confidently and that that your payload arrives ready to go to work. Aspen’s rail industry trailers are designed to get in and out of those challenging spots where your equipment is … or needs to go and can straddle the rails to minimize those awkward loading situations. Aspen’s rail industry trailers can be customized to meet your exacting requirements with custom deck’s, custom placement of load securement and other critical issues that need that personal touch or customization.